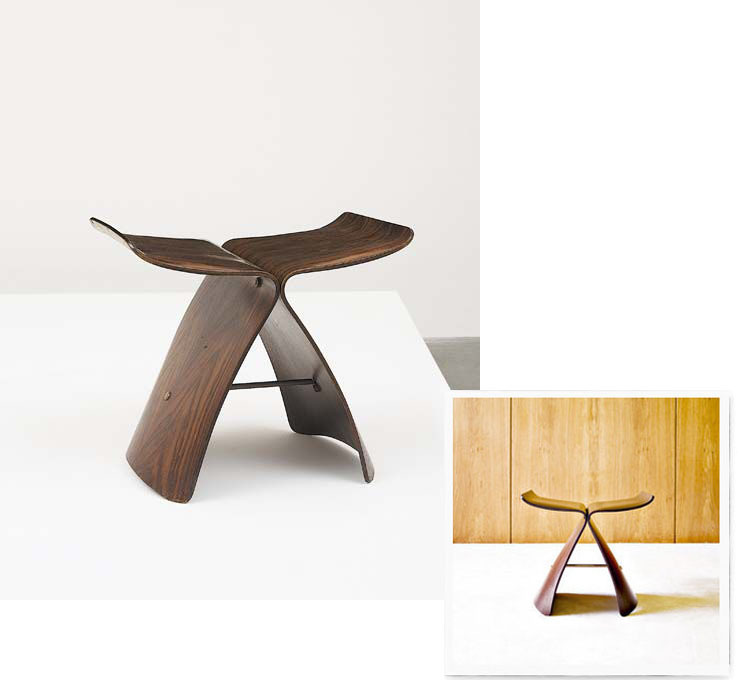 Is there any design object more beautiful than Sori Yanagi's Butterfly stool? The elegant Yanagi Butterfly stool is truly one of the most perfect side stools ever created. Created by the grand master of Japanese mid century modern design, Sori Yanagi, in 1956. The graceful Yanagi Butterfly Stool blends ancient Japanese forms with modern Western materials. Enduring icon of modern design: elegant, timeless, durable, sustainable and you will still love it in 25 years. The graceful Yanagi Butterfly Stool takes up a minimum of space and is perfect as a side stool in the entrance or lobby, bedroom or living room. This very hard to find, original Sori Yanagi Butterfly stool was made by the original Japanese manufacturer Tendo. This is not the Vitra production from Europe! Only 5 (five) pieces available through modern design retailer nova68.com from a "new old stock". In original Tendo Japan cardboard box, never used and in mint condition. Very rare original Sori Yanagi Butterfly Stool in Rosewood made by the authorized Japanese manufacturer Tendo. Purchased in Japan by the previous owners but they were never used. A rare opportunity to acquire the original Japanese edition of the Butterfly Stool. Marked with Tendo label and number (which could be different from the photo). Original Tendo cardboard box with Tendo logo. Authenticity is guaranteed.